Local authorities said that while the plane crash damaged several vehicles, everybody in the vicinity — including the pilot — walked away safely. Despite a video showing a fiery, dramatic small plane crash in Washington on Tuesday, nobody in the vicinity — including the pilot and his passenger — was seriously injured. The incident took place in Mukilteo, Washington, Tuesday afternoon, authorities told local Fox affiliate Q13. According to police, the pilot had been flying into the state from Oregon when he started to lose engine power. He was losing too much altitude to return to Oregon, so he attempted to land the plane on Harbour Pointe Boulevard, which he said was clear at the time. 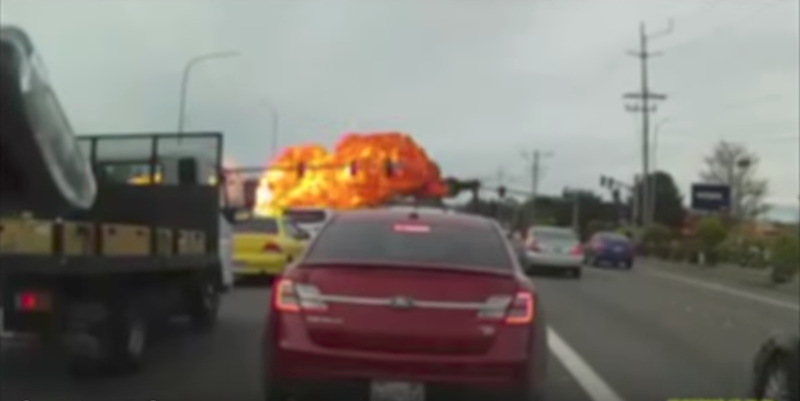 But video footage, captured by a man named Guanting Li and provided to several news outlets, shows the plane take a sharp decline and dip into traffic with an explosion trailing behind it. The Mukilteo Police Department, who handled the incident along with the Lynnwood Fire Department tweeted that there were no injuries. But several cars had been damaged by the crash. Witnesses captured video of some of the damage. Lynnwood Fire Department noted, however, that some people had sustained minor injuries. BuzzFeed News has reached out to both departments for more information.